Retired Supreme Court judge Milojka Kalkaslieva considers the draconian sentencing of the 16 participants in the April 2017 incident in the Parliament as gross violation of the rule of law, and believes that judge Dobrila Kacarska completely mishandled the case. In her remarks published today, Kalkaslieva says that the charge of “terrorism” was extremely over the top, and the sentence didn’t contain basic elements it should contain by law. The judge said that she will additionally explain her verdict in more detail, but that can’t restore her failures. She only read the draconian prison sentences, but did not explain what actions each of the defendants undertook to deserve such punishment. All we got was a reading of an essay on patriotism. We can only bow our heads in shame after this sentencing, judge Kalkaslieva writes. 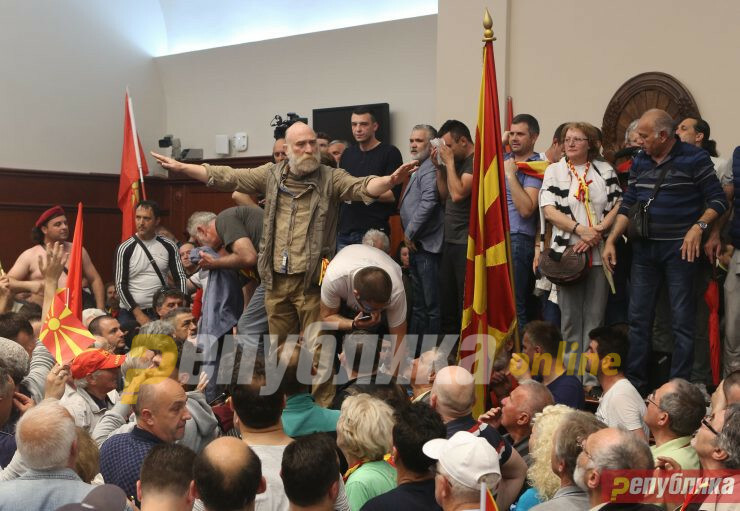 She describes that the lengthy protests were orderly and peaceful for months, with the participation artists, sports legends, cultural groups and many citizens who opposed the renaming and rearranging of Macedonia. The protesters were out to defend the constitutional order of the Republic of Macedonia, determined in the 1991 Constitution, which endangered by the Tirana platform, a document prepared in a foreign country. During their trial, we awaited to hear what is it in their actions that could be interpreted as “terrorist endangerment of the constitutional order and security”. We heard how the violence which did occur on that day was provoked by the attempted undermining of the constitutional order on the part of the members of Parliament, some of whom sang a foreign national anthem, while others remained indifferent to this. Some of the members of Parliament elected a new Speaker in violation of the Constitution and the rules of the Parliament, which provoked the protesters, while others opened the doors of the Parliament. All this does not excuse those who perpetrated violent acts, but their actions can’t be qualified as “terrorist endangerment”, Kalkaslieva adds. The Zoran Zaev Government used this extensive trial to blackmail three members of Parliament and force them to vote to rename Macedonia. In order to do this, it organized a selective amnesty deal for them and for some of the protest organizers and participants, but then Zaev’s loyalists judge Kacarska and prosecutor Vilma Ruskoska insisted on prosecuting all others to the maximum extent of the law. Only opera singer Igor Durlovski, who refused the offer of amnesty and defied Ruskoska and Kacarska to put him in prison as a terrorist, was released.